Newly published study provides new evidence of the widespread occurrence of cyanotoxins in lakes and reservoirs of the United States and offers new insights into measures used for assessing potential recreational health risks. In 2007, scientists completed the largest survey of cyanotoxins in the Nation's lakes. Scientists sampled 1,161 lakes across the Nation for cyanotoxins, cyanobacteria abundance, and chlorophyll-a—the three measures used by the World Health Organization (WHO) to determine associated human health risks in recreational waters ranging from skin rashes and nausea to liver failure and respiratory distress. The scientists measured several cyanotoxins including cylindrospermopsins, microcystins, and saxitoxins. Cyanobacterial accumulation at Binder Lake, Iowa, dominated by the blue green algae Microcystis sp. with a dead fish. Photo Credit: Jennifer L. Graham, USGS. 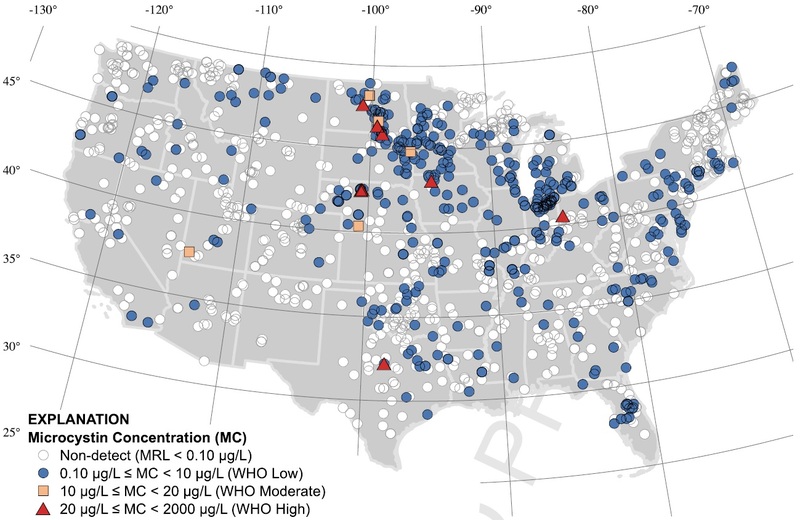 Although cyanotoxin occurrence in lakes was commonly perceived to have a local or regional occurrence, this study found multiple classes of cyanotoxins were present in lakes and reservoirs in diverse settings across the United States. Cyanobacteria were present in 98 percent of the lakes studied. Potential cylindrospermopsin-, microcystin-, and saxitoxin-producing cyanobacteria were present in 81, 67, 95, and 79 percent of samples, respectively; however, the toxins were present in 4.0, 32, and 7.7 percent, respectively, which indicated that cyanobacterial abundance can over-predict microcystin and other cyanotoxin exposure risk. The WHO moderate and high risk thresholds for microcystins, cyanobacteria abundance, and total chlorophyll were exceeded in 1.1, 27, and 44 percent of samples, respectively. There was direct agreement between the three WHO measures used for recreational risk on the basis of microcystin exposure in only 27 percent of the samples measured in this study, which indicated that algal abundance and chlorophyll-a concentrations may over-predict recreational risks associated with cyanotoxins. The lack of similarity among the WHO thresholds was expected because chlorophyll is common amongst all algae and not all algae produce microcystins. There is increasing public recognition that cyanobacteria and their toxins can have a toxic effect on water use and quality. Some cyanobacteria produce toxins that can kill wildlife and domestic animals and cause illness or death in humans through exposure to contaminated freshwater or by the consumption of contaminated drinking water, fish, or shellfish. The discovery, in 2014, that the City of Toledo, Ohio, water supply was contaminated by microcystins drew national attention to the potential vulnerabilities of our water resources to toxins formed in association with harmful algal blooms. 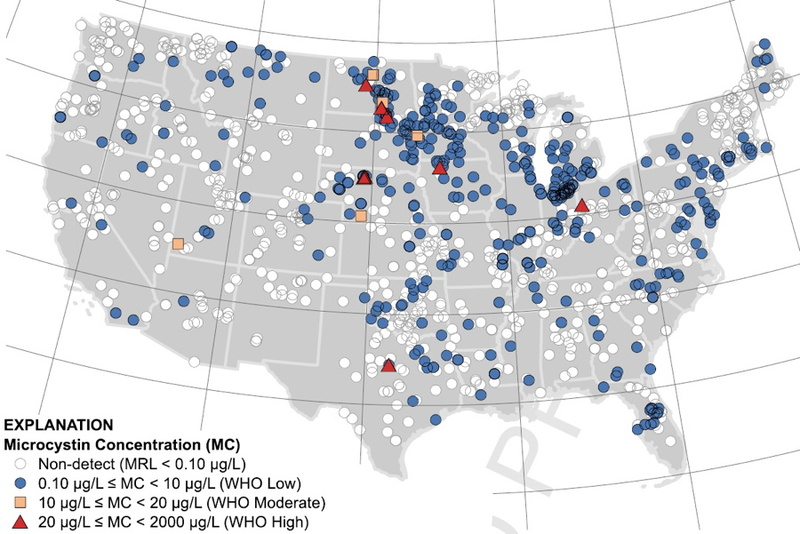 Map of the occurrence of microcystins in lakes across the contiguous 48 U.S. states categorized by World Health Organization (WHO) relative probable health risk. WHO low, moderate, and high refer to the relative human recreational health thresholds for microcystin exposure. Map not shown to scale. Map Source: Loftin and others, 2016. Typically, studies done for harmful algal bloom event response programs only measure microcystins or algal abundance and less frequently chlorophyll or other cyanotoxins, whereas ambient monitoring programs usually focus on chlorophyll and algal abundance measures to assess health risks. This study demonstrates that monitoring for chlorophyll is not a reliable indicator of the presence of microcystins; monitoring for microcystins is not a reliable indicator of the presence of saxitoxins and cylindrospermopsins; and that microcystins are not the only toxins for consideration of risk to humans and animals. This study provides information needed to understand the relation between current (2016) measures of potential recreational health risks of cyanohabs and highlights the importance of selecting measurements that closely relate to monitoring objectives. This assessment was performed as part of a broader U.S. Geological Survey (USGS) research project on cyanotoxins. The broader research goals include determination of factors related to cyanotoxin production and factors that may influence or create new environmental pathways of cyanobacteria that lead to human and ecological exposure and adverse outcomes. This research was funded as a joint collaboration by the USGS Toxic Substances Hydrology and National Water Quality Assessment Programs, and U.S. Environmental Protection Agency's Office of Wetlands, Oceans, and Watersheds and National Health and Environmental Effects Research. Loftin, K., A., Graham, J.L., Hiborn, E.D., Lehmann, S.C., Meyer, M.T., Dietze, J.E., and Griffith, C.B., 2016, Cyanotoxins of inland lakes of the United States--Occurrence and potential recreational health risks in the EPA National Lakes Assessment 2007: Harmful Algae, v. 56, doi:10.1016/j.hal.2016.04.001. Loftin, K.A., Dietze, J.E., Meyer, M.T., Graham, J.L., Ziegler, A.C., Maksimowicz, M.M., and Toyne, K.D., 2016, Total cylindrospermopsins, microcystins/nodularins, and saxitoxins data for the 2007 United States Environmental Protection Agency National Lake Assessment: U.S. Geological Survey Data Series 929, 9 p., doi:10.3133/ds929.